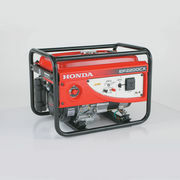 The Honda EP2200CX produces a max of 2200 watts AC, and rated output of 2000 watts. It is also fitted with anti-vibration engine mounts and a large noise nullifying muffler to provide a well rounded product. It provides stable power through its Automatic Voltage Regulator system which automatically compensates for fluctuations when the generator's load changes. 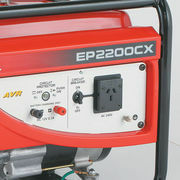 The EP2200CX also features the AC/DC circuit breaker for extra safety, while the oil alert light comes fitted also. The control panel consists of a huge 15 amp sockets, battery charger and circuit protector. 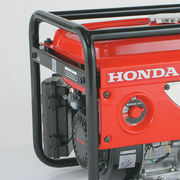 The GX160 Honda engine is both reliable and lightweight designed over 30 years ago and is known for its efficiency and power. 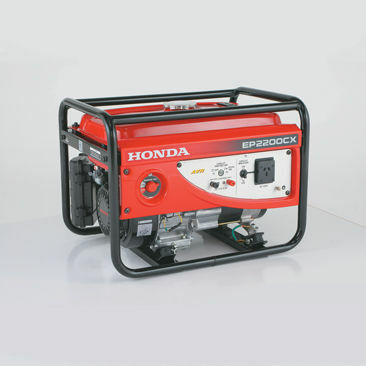 The Honda 4-stroke technology also means that you'll never have to mix your fuel again whilst 4-stroke engines are also quieter and produce less emissions. The EP2200 produces at a noise level of 66dB(A) and has a fuel tank capacity of 14.5 litres while only weighing 45kg. 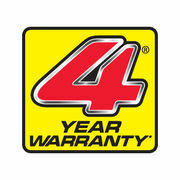 And as usual this Honda product comes with a 4 year domestic warranty and 1 yr commercial warranty giving you piece of mind.